A review of the preseason through the lens of Charles Darwin. The NFL season is finally here. After about five months of offseason and two months of official training, players are strapping on their pads and putting on their game faces —those who are healthy enough to play, at least. Natural selection, widely identified with the phrase “survival of the fittest,” is a biological process by which organisms with certain inherited traits are more likely to survive and reproduce than are individuals with other traits. While a word-for-word translation to football terms cannot precisely be made, certain parallels between the theory of natural selection and occurrences of the NFL preseason can be drawn. This column separates natural selection into two fundamental observations and Darwin’s ultimate conclusion to compare it to different aspects of the NFL preseason. Due to the length and amount of data analyzed, this column will be a three part series. Part 1 focuses on preseason injuries and how, I think, they can be dealt with going forward. Here we go. Natural Selection Observation 1: Overproduction and competition. Populations of all species have the potential to produce many more offspring than the environment can possibly support with food, space, and other resources. This overproduction makes a struggle for existence among individuals inevitable. NFL Preseason Parallel 1: The preseason itself is what makes struggle for existence among individuals inevitable, with overproduction, or overpopulation in this case, a necessary consequence. The NFL preseason, which serves as the transition between the offseason and the regular season, consists of individual team training camps and televised preseason games. As of August 30th, 222 players were injured in some form during the preseason (specifically between July 1st and August 30th), with 84 of those players, or 38%, likely out for the entirety of the regular season. Preseason injuries are a major issue that have had their fair share of publicity. Many sportswriters feel the most appropriate course of action would be to simply decrease the number of televised preseason games played, consequently taking injuries that might have occurred during those games out of the equation. I personally think the NFL can take a more proactive approach. The problem lies not entirely with the preseason games themselves, but with the training camps that precede them. If you decreased the number of preseason games, the number of preseason injuries would in turn decrease, but surely the number of early regular-season injuries would have a corresponding increase. The players are not prepared coming out of the offseason and training camp to be playing NFL games, regardless of what point of the season or preseason the calendar indicates. Whether this means their conditioning is not yet at a level where it should be, they haven’t had enough practice correctly emulating the motions that they will be forced to make in games, or they aren’t mentally prepared to quickly make certain decisions on the field, NFL players simply aren’t ready. All proposals from the NFL regarding decreasing the number of preseason games are coupled with an increase in regular season games, which is not a solution to the injury problem (TV revenue is another story). I maintain that the NFL should decrease the number of preseason games, but also increase the time allotted for training camp. According to the schedule of key 2013/2014 dates released by the NFL, training camp begins sometime in mid-July (different reporting dates for different positions), and effectively ends for all teams during the first weekend of preseason games, which this year was August 8-11. Although there are offseason activities, commonly referred to as OTA’s (organized team activities), they are often not mandatory and do not necessarily involve on-field time. A roughly three-week period for players to prepare for live games is clearly not sufficient. I believe that if players were given the opportunity to slowly build themselves up after the offseason, the number of injuries would substantially decrease. To simply cut down the number of preseason games does not solve anything, because regardless of whether you call the games preseason or regular season, players will continue to get injured during this part of the year if other changes aren’t made. Now granted, “freak” injuries are an unfortunate, but relatively constant part of the game, and it is obviously not reasonable to aim to make changes that will remove all injuries from the preseason, but certain occurrences are preventable. For example, on August 24th, during the third week of the preseason, starting New York Jets quarterback Mark Sanchez was inserted into the game early in the fourth quarter against the New York Giants. I won’t attempt to defend the move, but within minutes, Sanchez left the field for the locker-room, where he had an X-ray taken after a hard hit by a second-string defender on the Giants. Nearly all of the blame for this has fallen on head coach Rex Ryan, and while much of it is deserved, Ryan was not on the field. The New York Jets second-string offensive line, however, was on the field, going up against the second-string defensive line of the Giants. While these players are not the best the NFL has to offer, these are still professional athletes going against a similarly skilled opposition. Perhaps if they were given more time to physically and mentally prepare themselves for live games, the hit on Sanchez would have been prevented, because it’s not as if they were severely overmatched. These events are in line with the injury statistics, as offensive lineman suffered the second most injuries of any position, suggesting they specifically are not sufficiently prepared by training camp for preseason games. I believe the Sanchez injury is the poster-child for injuries that could be prevented if alterations to the preseason were made. Despite the substantial difference in total injuries, knee injuries were roughly of the same proportion in offensive players as defensive players, 29% and 30%, respectively (roughly 30% of all injuries). There were 14 concussions reported out of the 222 injuries, or 6% of total injuries. Of the 8 offensive concussions, 6 were to wide receivers. 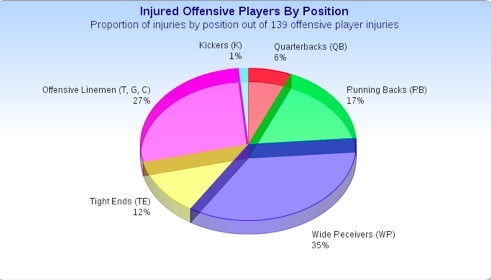 Defensive players suffered 18 different types of injuries, whereas the entire population of offensive players had 23 different kinds of injuries. Of the 66 total knee injuries suffered during the preseason, exactly 50% (33) were season-ending. Of the 49 injuries to wide receivers, 47% were season-ending. 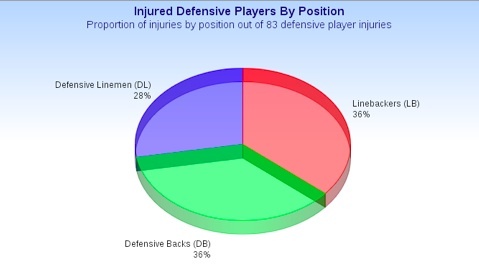 Even though defensive players only made up 38% of the total number of preseason injuries, 37 of the 83 injuries were season-ending, or 45% of defensive injuries and 17% of all injuries. 35% of all linemen injuries (both offensive and defensive) were season-ending. Of the 27 different types of injuries reported, 13 different types of injuries resulted in a lost season. To further understand the impact of training camp and preseason games on a week-by-week basis, I divided the preseason into weekly subgroups, starting with the week of July 15th when players begin reporting to camp and ending August 30th, and determined the number of injuries that occurred during each week. I then tested for correlation between week number and number of injuries and found that it was perfect monotonic correlation, meaning strong, positive, and statistically significant correlation. The data is provided below, but essentially, every week displayed a significant increase in the number of injuries sustained, possibly suggesting that players are not properly prepared to not only play live games, but also to ramp up training to the extent they do in weeks two and three of training camp. Just for comparison, it’s not as if the data yielded a bizarre up-and-down pattern of preseason injuries. My contention — that the preseason needs to be reformatted to better prepare the players for the demands of NFL games by decreasing the number of preseason games and increasing the amount of time allotted for training camp — is supported by the injury data. The positive correlation clearly shows a trend throughout the duration of the preseason. There is no reason that there should be 52 more injuries during the final weekend of preseason games than the first weekend (preseason weeks 7 and 4, respectively). It is reasonable to believe that if players had the opportunity to build up a substantial foundation during training camp, they would be more likely to make it through the preseason without wearing down and consequently suffering an injury. It is worth noting that while using an observational study to formulate cause and effect conclusions is not considered statistically rigorous, the conclusions suggested here are not in any way to be considered concrete, but rather are to act as analytical conjectures that could serve as an impetus to begin experimentation and further study. In the second part of this three-part review of the NFL preseason, the first observation of natural selection and how it relates to injuries will be further explored, as 2013 pre-season injury data will be compared statistically to 2010 pre and regular season injuries. Also, coming up, the concept of necessary overpopulation will be discussed in looking at roster sizes and roster-cut dates in a transition between the first and second natural-selection observations. This is why teams don’t always play their best quarterbacks during Pre-season. Wonderful Article. Interested to see upcoming installments!